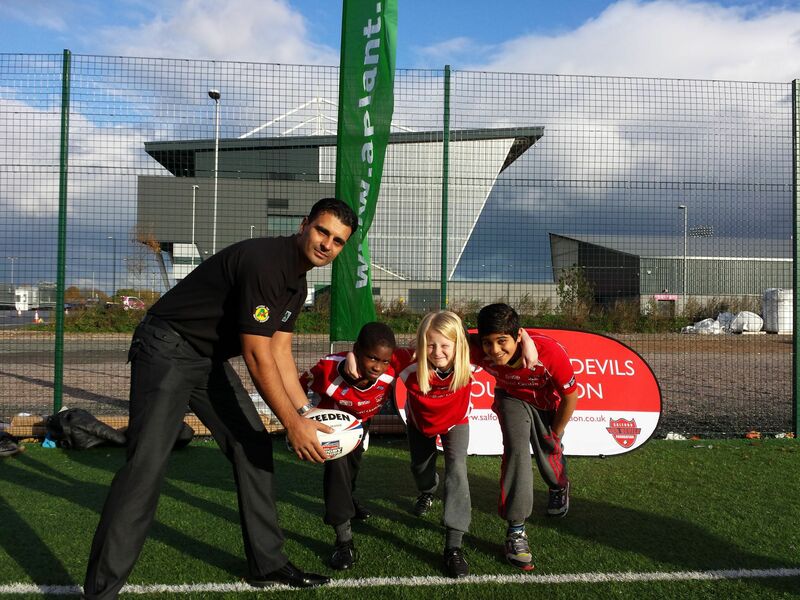 Tomorrow is an exciting day for the Salford Red Devils foundation as we host the inaugural A-plant sponsored rugby league festival at the AJ Bell Stadium. The Foundation welcomes an impressive 25+ teams to the festival to compete against each other and showcase their talent and skills. The young rugby enthusiasts are invited and encouraged to put their training into practise, and are sure to be cheered on by friends, family teachers and even some of the Salford Red Devils first team players! A key emphasis of tomorrow for the student players is that of teamwork and participation, to promote the squads to work together toward a goal and implement their rugby skills. The Foundation coaches will be around promoting healthy living and active lifestyles, as well as ensuring all teams have a fantastic day! With teams from primary schools such as St. Marks, Lightoaks, Gorse Hill and year 7 teams from St. Ambrose Barlow, Wellacre, Albion and more it is sure to be a great day for the local community and create some fun competition between the local schools! After such a successful day last year, the Foundation team are really excited for the festival tomorrow and want to make it another excellent day for everyone involved. To keep you updated with the winning teams, follow us on Twitter @SRDFoundation and click HERE to like us on Facebook.